John William Morris was born on February 6, 1875 at Honey Hill near Searcy, in White County, Arkansas to George Louis Morris and Sarah Sewell Morris. He was the fourth of eleven children. His father was a farmer and young John learned what hard work meant as he helped his father. When he was sixteen he contacted typhoid and decided then to become a doctor. He enrolled in Searcy Military Academy, from there went to University of Louisville in Kentucky then to University of Nashville Medical School. He graduated on April 6, 1900 at the age of twenty five. Dr. Morris bought the practice of Dr. Walter Limpkin at DeView, just outside of Searcy, who was retiring. He lived in the back room of the office. From the first day, on April 21, 1900 (15 days after finishing Medical school), he was called to see his first patient, a boy with pneumonia due to a complication of measles. He made the call on horseback a method he continued for many years. On December 19, 1901 he married Amma Gray Burkett and moved into a house left by De. Lumpkin. “Mrs. Morris was the perfect complement to the busy doctor—she frequently accompanied him on his calls when she was needed, fording the river and enduring the weather. She cared for the sick in his absence—and even saddled a horse to keep him on the road.”* The couple had two children a boy and a girl. Mrs. Morris died on November 26, 1971 just before celebrating seventy years of marriage. Dr. Morris championed Public Health in his practice. The first house he built in DeView had screens on the windows prompting neighbors to inspect to make sure the doctor was not suffocating with the window covered. He initiated flood controls and roads. His own and several other farms were improved by his drainage project. He brought the first telephone and electricity to connect his office to out of town communities. The first car in town was a 1915 Hupmobile owned by Dr. Morris. In 1920 (after about 20 years in DeView) he moved to McCrory in Woodruff County, Arkansas and bought a drug store. He then built a new house and in 1936 he constructed a clinic on Main Street made of stones from White County, the first stone structure in McCrory (The building is listed on the National Registry of Historic Places.) The clinic had four beds and two examining rooms and an arcading porch extended across the front. It was said to be the best equipped building in the country. 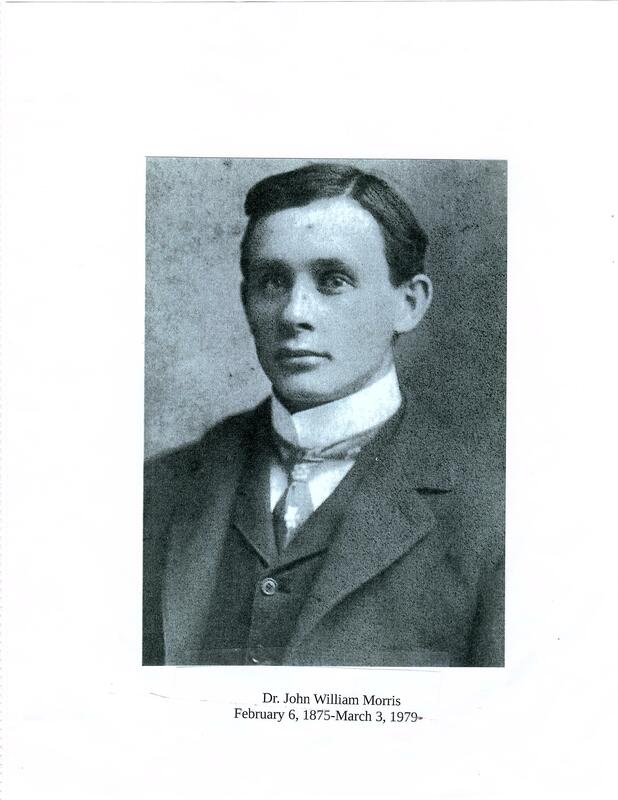 Dr. Morris continued to practice medicine in McCrory for about 46 more years. He used the old house in DeView for visiting relatives and for Hendrick Collage students who came to help with revivals. Mrs. Morris was a great help with feeding the students. On his hundredth birthday after the national TV networks recorded the occasion, he went back to work the next day and treated twenty five patients waiting in his clinic. One more year of practice, then he retired at the age 101. He had practiced medicine for 76 years, his whole life a service to his fellow man. Dr. Morris died March 13, 1979 at the age 104. He is buried in Oddfellows Cemetery DeView, Arkansas.